Heat oil to medium to medium-high heat for frying. Preheat oven to 250°F. Sift flour, sugar and baking powder into a bowl and combine with salt, pepper, mustard, paprika, cayenne (if using), and onion and garlic powders. Stir in cornmeal. In a separate bowl, whisk together the egg, milk, hot sauce (if using) and remaining 2 tablespoons oil. Stir the wet ingredients into the dry with a wooden spoon until smooth. Pat hot dogs dry, thread them on skewers then dip to coat in the batter. Fry 2-3 dogs at a time in the hot oil to deep golden all over, 4-5 minutes. Drain cooked dogs on a cooling rack set over a baking sheet and keep them warm in the oven as you finish the rest. In Recipes-list.com we have selected the most viewed recipes from category - uncategorized . Enjoy the best recipes specially selected for you! 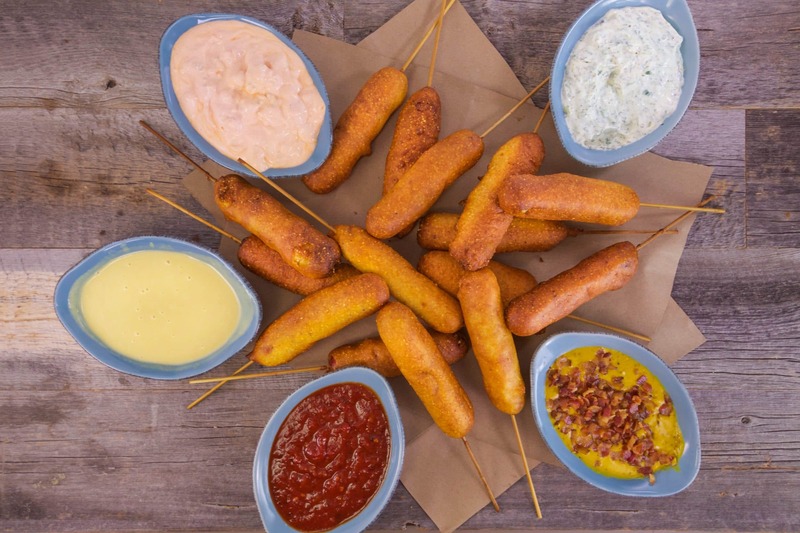 Firecracker Deviled Corn Dogs is the right choice that will satisfy all your claims.